NOTE: This article was originally published September 6, 2011 and is updated. A dear friend recently asked for my opinion on a handgun for defense, which prompted me to consider writing an article for the THP blog. Discussing defense weaponry is akin to discussing Politics or Religion, in that hardly any two opinions are alike and heated discussions usually ensue. I view the first two items with a higher relevance than Personal Defense, because Family members and friends are usually involved making them higher priorities. A Hand Gun is just a tool and there are NO perfect tools that apply to all situations and problems. There are several considerations that are applicable to all three of the aforementioned scenarios. When developing your action plan, first and foremost in your thinking should be the safety of your family, neighbors, friends and innocent by-standers. High powered hand guns can penetrate walls, vehicles etc. and place in jeopardy the very ones you are trying to protect or others who are nearby or simply just walking their dog. Any gun is useless if it does NOT stop the Predator - Human or otherwise and this creates a dilemma because of the possibility of Unintended Collateral Damage. These Handguns have been developed in recent Years for 'Close Combat' situations - both have tremendous Stopping Power when combined with the proper ammunition and have less chance of Collateral Damage than high powered Handguns i.e. .357 or .44 Magnums. The Judge Taurus is chambered for both .410 shotgun shells and also the .45 Long Colt cartridge and holds 5 rounds. The Smith&Wesson Governor is chambered for .410 shotgun shells, the .45 Long Colt cartridge, .45 ACP and holds 6 rounds. Typically Home, Auto and Personal 'Combat Defense' situations occur at short range and therefore normal handgun accuracy is moot. The advantage of the .410 Shotgun Shell is the dispersion of pellets over a greater portion of the Predator’s body, this render's a different kind of fight-stopping trauma because the kinetic energy developed by several pellets is transmitted to the target—broadly and instantaneously. 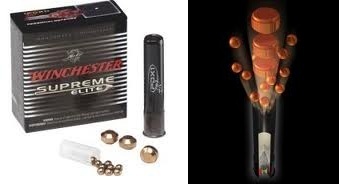 Federal, Remington and Winchester have ammunition especially loaded for the .410 aspect of the Judge and the Governor - IMO, the Winchester load is best, combining cylindrical, rather than spherical, projectiles and beneath the load they include BBs (12 in the 2½ inch shell and 16 in the 3 inch shell). NOTE: All Federal, State and Local Laws should be followed and proper licenses and permits obtained.